I got this fabulous award from a cute friend of mine Precious. 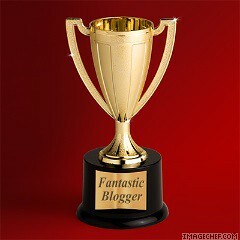 Thank you sis for sharing me this fantastic blogger awards. Sorry for the delay but I really love this award so much. And I would like to pass this awards to Lira, Chinny, Laura, Lynn, Amy, Bless, Joy, Avee, Emz, Cora and to all my blogger froends who like this tag. Just feel free to grab this anytime you want. Take care and God bless you all.